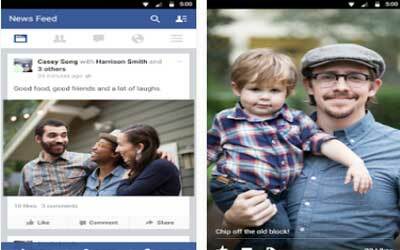 Previous version Facebook 144.0.0.27.91 apk for Android will help you to downgrade or install older app easily. This is one of the best Social apps. You can share your photos and video with best streaming quality from your android. You can also share link to your FB contacts based on your privacy setting, so you can manage who can see your timeline and other post. You can also upload photos and tagging some friends through your android. There are many things to do with Facebook besides chatting and uploading photos. You can use it to make an event and inviting some friends by tagging them on your event. You can play game from your FB by choosing any game you want to play on your FB. Other feature that you can get from the latest version is Facebook messenger. This is the best feature from FB that you should consider. You can chat with friends through this feature with better appearance. You can also send some emoticons and stickers to your friends through this feature. You can also check online contacts, so you can chat with your friends in live chatting. You should not open your inbox anymore with this feature; you can automatically to chat with your friend with this feature of facebook for Android. This app just updated and it’s amazing! Fast! Quick click for messenger. Runs really great!